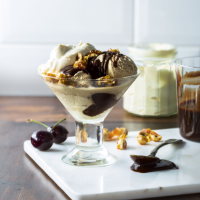 Liqueur, coffee and chocolate come together with magnificent effect in this decadent sundae. 1. Start by making the candied nuts: put the hazelnuts and caster sugar in a small frying pan and set over a medium heat. Cook for 2-3 minutes, swirling the pan occasionally, until the sugar has turned a dark golden caramel and the nuts are lightly toasted; take care as it can burn easily. Tip onto a sheet of baking parchment and leave to cool completely before roughly chopping. 2. For the sauce, put all the ingredients, apart from the Baileys, in a small pan. Melt over a medium-low heat for 5 minutes, until combined, then whisk in 1½ tbsp Baileys with a pinch of salt; set aside to cool briefly. 3. Divide the ice cream between 2 glasses or bowls, pouring mocha sauce between the layers, then scatter over most of the chopped candied hazelnuts. 4. Whip the double cream to soft peaks, then ripple through 1½ tbsp Baileys before spooning on top of the sundaes. Finish with the remaining candied hazelnuts and top each with a cherry, if liked.